Rain. 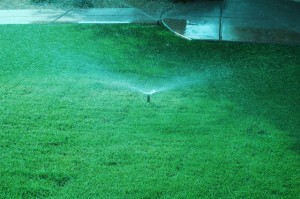 The perfect complement to assisting your irrigation system. In the southwest we welcome rain to our dry environment. It’s a chance to shut off your irrigation controller or initiate the rain delay feature on your controller if it has one. Controllers with this rain delay feature usually offer one to seven days of when the irrigation system will not turn on. After the specified period of rain day delays is reached your programming will re-start. If you shut down your controller manually don’t forget to turn it back on when your landscape dries out again. During fall, winter and early spring, evaporation rates and temperatures are low. Soil moistures rise and persist for longer periods of time. It is a good time to save water. Nothing says water waste like sprinklers running in the pouring rain.